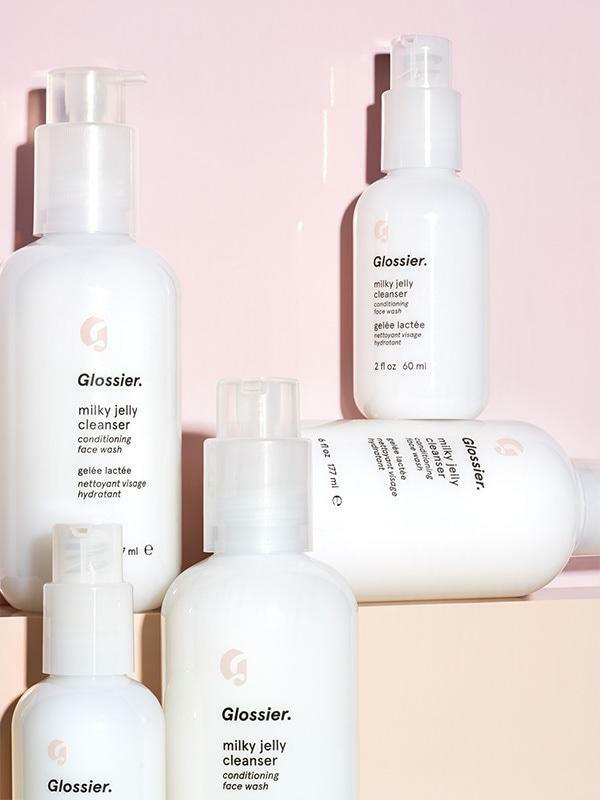 Glossier Milk Jelly Cleanser: It's a little like Cetaphil, but way better, and rose-scented. I'd guesstimate I've purchased upwards of 30 of these over the years—so many that the Glossier consumer marketing team reached out to me and asked if I'd give them feedback on the product... you know, since I've used so much of it. Milky Jelly Cleanser is super-gentle and super-effective, it removes all my makeup, helps keep any oiliness in check without stripping the skin, never leaves me feeling irritated, and I've noticed a significant drop in rash / eczema / breakouts since I've started using it. Over the past few years, I have lapsed and tried other hyped cleansing products, but I always regret it and repent by ordering more Milky Jelly Cleanser. My only feedback to Team Glossier would be: I need this in both a TSA-friendly travel size as well as a mega-giant jumbo bottle size for home. 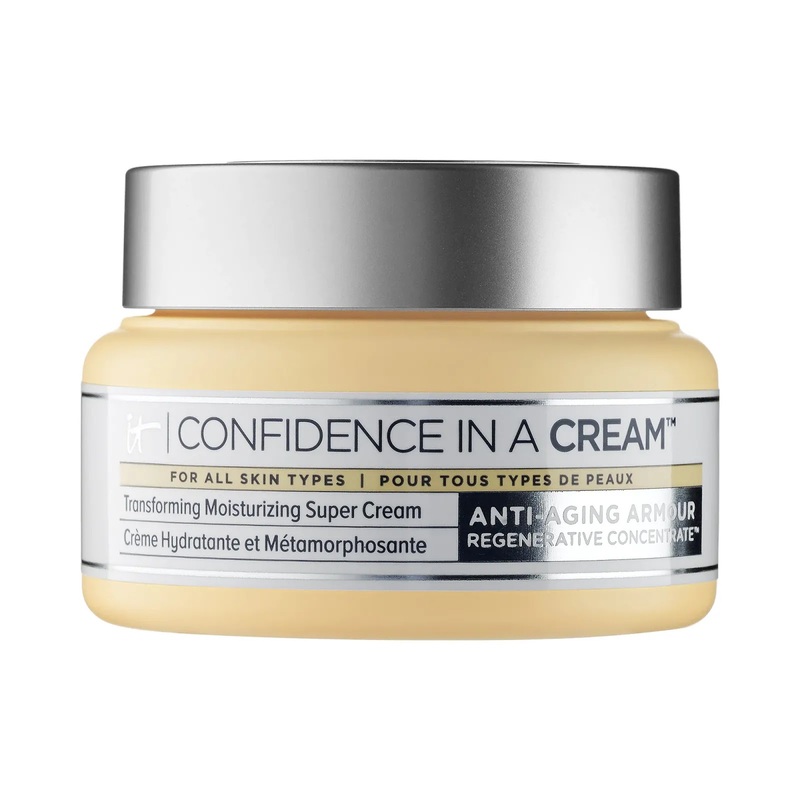 It Cosmetics Confidence in a Cream: I started using Confidence in a Cream because I had been using Charlotte Tilbury's Magic Cream for a while and was looking for a less expensive alternative. Now I love Confidence in a Cream and I don't think I'd go back—even if I won the lottery or something. I use Confidence in a Cream as a day cream—it's great under makeup and I don't need a primer on top of it—it's light but rich enough to last all day. I've probably gone through a dozen jars of this stuff and tbh what I like most about it is that it's uncomplicated, doesn't irritate my skin, looks smooth and great under foundation, and I feel like, over time, very gradually, it's improved the appearance of my skin—i.e. I definitely notice a difference when I stop using it and think I want to experiment with something new. 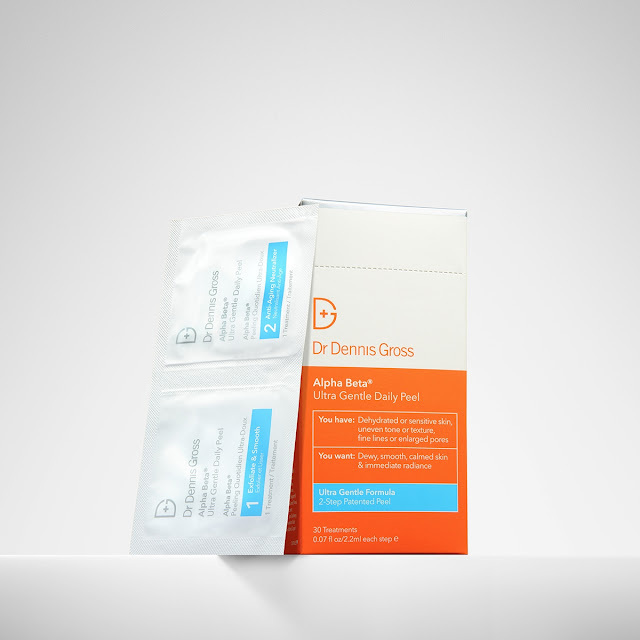 Dr. Dennis Gross Alpha Beta Ultra Gentle Daily Peel for Sensitive Skin: Ask any of my friends or relatives— I've been evangelizing the Dr. Dennis Gross Alpha Beta peels for years. But instead of daily (because I have this irrational fear of my skin becoming dependent on acids), I use them once or twice a week to exfoliate, clean up and tighten my pores, and, subsequently, help my other skincare work / absorb better. The pads are especially useful for travel—they're individually packed and are the best thing to use as soon as you hop off a long flight and check into a hotel—very refreshing. Sweat sessions at Shape House: OK, Shape House is not technically a beauty product—it's a 55-minute infrared wrap joint that just landed in New York City from Los Angeles earlier this year—and I'm obsessed. Far Infrared treatments are clinically proven to have all sorts of positive health benefits—and while, sure, it would be nice to lose weight from all these sweat sessions I've been booking this fall and winter, if that happens it will come with time. For me, the most immediate result of sweat sessions at Shape House is that my skin has been looking great. I think it's probably the result of just, you know, a very straightforward correlation of sweating things out of my pores on a regular basis, which thereby pushes bad gunk out of my pores. Other side effects of sweating at Shape House: I feel deeply relaxed and somehow simultaneously energized after each session and it's so nice to lie perfectly still for an hour several times a week tucked into a toasty blanket while it's blustery and cold outside. 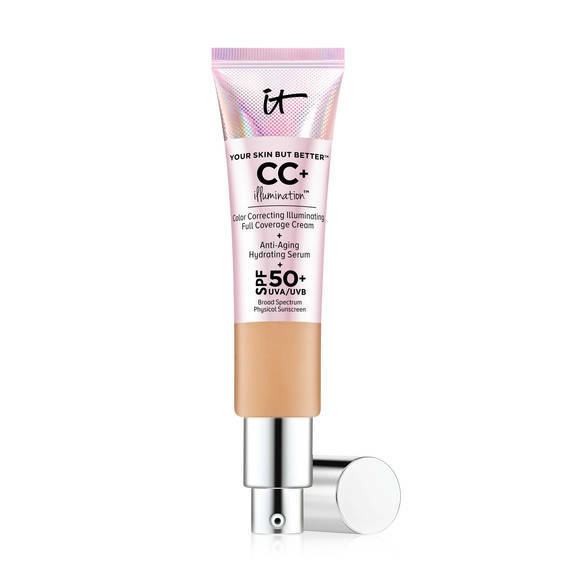 It Cosmetics CC+ Illumination with SPF 50+: I'd been using the normal non-illuminating version of this CC cream / foundation for a year before I mustered up the courage to try the illuminating version—I was worried it would make me look shiny, sweaty, or sparkly. But then I watched a Pixiwoo beauty tutorial where they used it and it looked so good, I had to try it—and the rest is history, I've never looked back. I love that this foundation looks like skin, has good coverage but is also sheer-ish. It stays all day, is illuminating, so I don't feel like I get a gray cast from it (which sometimes happens to me with matte-r foundations), and it photographs and videos beautifully. I set it with a translucent powder from Rimmel (I was using Charlotte Tilbury powder, which I love, but honestly it's $45 and that's a lot for a tiny pan of pressed powder) and then dust a little MAC Studio Fix on top as well. I also have this feeling that the CC+ cream makes me look... younger?